This beautiful home is located in the highly sought after Wren school district and is ready for new owners! 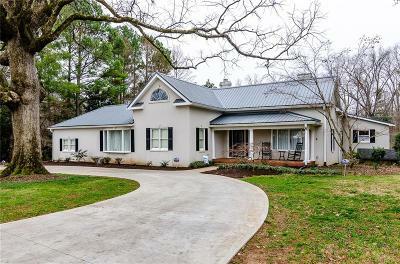 Sitting on 3.09 acres you get the country feeling you want but with the convenience of only being minutes from town and easy access to I85. This home features three bedrooms including a large private master suite with its own private entrance. The character of the home has been kept throughout from the original hardwood floors, to the crown molding, and even the ship lap in the dining room. A set of glass doors leads out onto the huge deck overlooking the land and fenced in pool. Some of the upgrades include a new metal roof, semi-circular driveway, and the in-ground pool has a new pool liner and cover as well. To the left of the home sits another private drive perfect for adding your dream garage, workshop, or even a guest house if you so desire. Come check it out today! Please NOTE: the chandeliers in the dining room and guitar room with bay window are family heirlooms and will NOT CONVEY!